Those three inches cost us eight hours in the emergency room. A heavy, cast iron grilling pan slipped off the side shelf and landed squarely on my husband’s right big toe. Though he hopped around swearing beneath his breath and blood dripped everywhere he hopped, we didn’t think it would be so dramatic. At the advice of our nurse and doctor neighbors, we went to the hospital for a look and a tetanus shot. The kids rallied, threw on cover ups, grabbed iPods (thank goodness) and off we headed, with my husband’s toe still bleeding all o ver. Huddled in the small room together, we learned that the damage was actually quite severe and it was good that we’d gone in, his toe was broken, he nail bed was smashed, he needed stitches and he was still bleeding. The whole day, he kept apologizing and we kept laughing as people wished me a happy Mother’s Day, but really, it could’ve been so much worse. We were together. 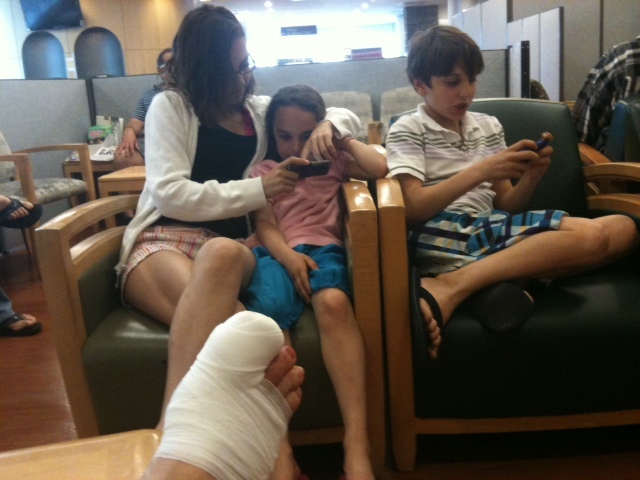 My three sweet kiddos, my dream-man-husband, hunkered down in waiting rooms, triage rooms and small ER rooms. We were together. Even though at times I was reading my book, the kids were entertaining themselves with technology, and my husband rested and watched some TV, we also shared little snuggles, kisses, told stories and colored. There were no words of bickering, there was not a single complaint, we were harmoniously, peacefully together and I just felt thankful. There are so many people who don’t have what we have. So many people struggling, suffering, unhappy, and all I could think was that, while this isn’t how we’d envisioned our day together, we are so lucky, so blessed and really so happy. Looking at my family, the five of us all together, I smiled with gratitude. It was a Happy Mother’s Day after all.